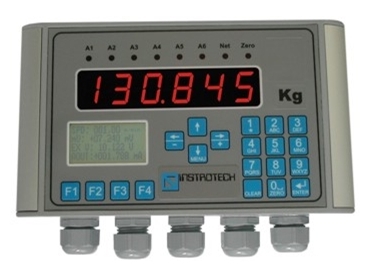 Instrotech Australia offers is a unique multi-function weighing transmitter indicator. Model 6004MF multi-function weighing transmitter indicator features an operating transmitter that is user-selectable for a variety of weighing, packing and materials handling applications. The weighing transmitter indicator incorporates the latest 60MHz 32-bit ARM7 micro-controller to handle the different application programs and also includes an SD card firmware boot-loader function. The alphanumeric keypad allows users to enter tag numbers, calibration date, technician's name and a host of other options. Relays may be configured as on/off, annunciators, fault or pulse counting outputs with hysteresis and time delays. The four function buttons on the indicator may be configured to toggle displays or to change or accept alarms. The weighing transmitter incorporates PI control to allow the output to be used directly for load cell control or flow rate control. A useful feature is the simulator, which allows belt speed, analogue output and relay control to be simulated during system commissioning. A 15-point lineariser, min/max display hold, preset tare and auto-zero maintenance are all user selectable and programmable. The many functions, digital inputs and optional methods of setup are fully explained in the comprehensive operating manual supplied with the weighing device.